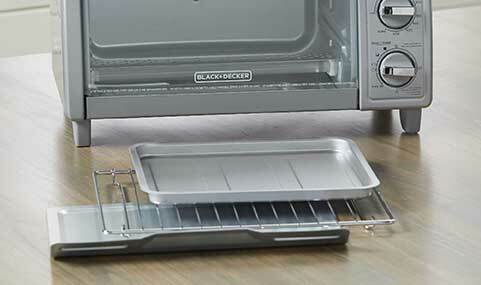 Great for cooking snacks and whipping up appetizers fast! 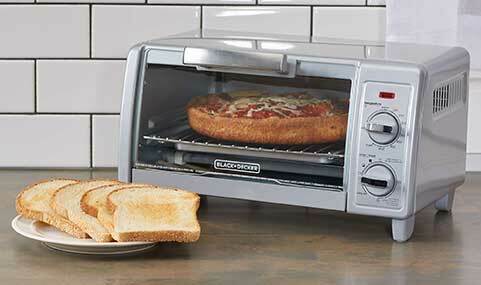 This toaster oven fits a 9" pizza or four slices of bread, and the simplified dial controls let you set the 30-minute timer and choose to bake, broil, toast, or keep warm. 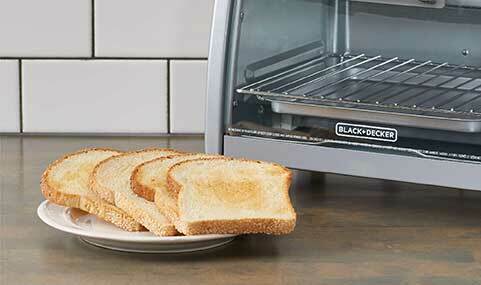 Plus, our exclusive EvenToast Technology™ delivers delicious and evenly done toast. 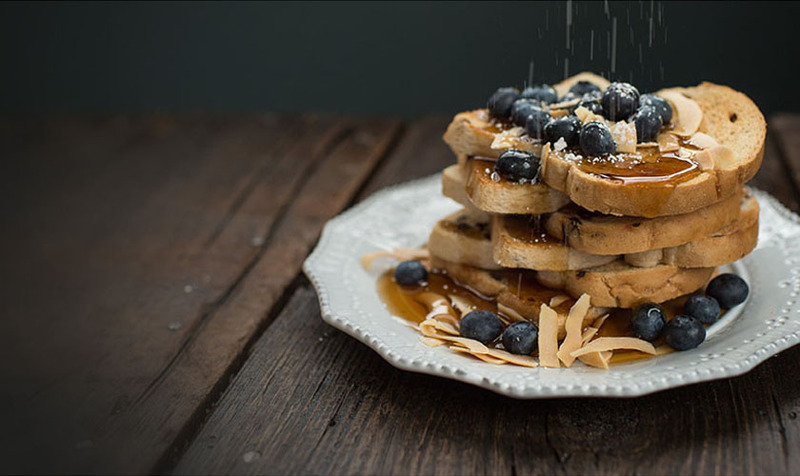 Consistent heating for evenly toasted bread. 4-Slice Toaster Oven, Easy Controls is rated 2.3 out of 5 by 3. Rated 2 out of 5 by jhnsn ds from Burner shields Not enough information to make an informed decision. 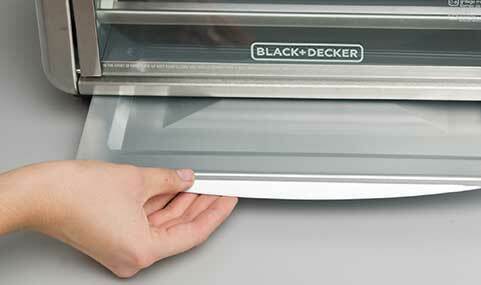 I currently have a black and Decker 1500 watts and its nice because the light burners which its equipped with 2 at the bottom and 2 at the top and they are not small in diameter have shields over the top of them which is missing among many other ovens. These burners will not give off even heat once food hits them and burns off. Their will be a dark spot on the burner tube. Dials are good less start up energy consumption. Rated 1 out of 5 by Franz from Horrible dials Impossible to turn off. The bottom dial is round (no mini-handle to grab with your thumb and finger) and impossible to grip well enough to turn the dial backwards, especially if the toaster has been running for a while and you want to shut it off. I have to use an oven mitt on my other hand to hold it down while I struggle to turn the dial. I'm not arthritic and I'm in my 40s; I pity the person who buys this and is a senior or arthritic. Do yourself a favour and buy one with a different style dial. B&D - you should anything with this style dial off the market. Rated 4 out of 5 by Finch from Works pretty well But there is NO removable crumb tray on the bottom. All the food falls down there and burns. They say not to put foil there, but you have to, unless you want to clean the bottom after every use. I recently purchased a model No. TO1322SBD. I accidently miss place the english operating intructions. I'm writing to see if possible to obtain a copy of. It would be greatly appreciated. How many heating elements in oven? What type of elements: quartz (thick, opaque) or non-quartz (slender, dark)?